Christmas is an expensive time of year, especially in London, so indulge in these free ways to get into the festive spirit in the capital. You won't have to spend a penny — though of course there are plenty of chances to get rid of your money if you're so inclined. The Christmas behemoth that pops up in Hyde Park every winter is free entry, meaning you can wander around to your heart's content without spending a penny. To dodge the crowds, avoid weekends and evenings — we recommend weekdays early in the run, or wait until the final week in January. Sure, if you want to have a go on those funfair rides, go ice skating, watch the circus, get some food and drink, do your Christmas shopping at the Christmas market or enter the ice kingdom, you'll have to pay (and steeply too). But just for wandering, it's completely free. 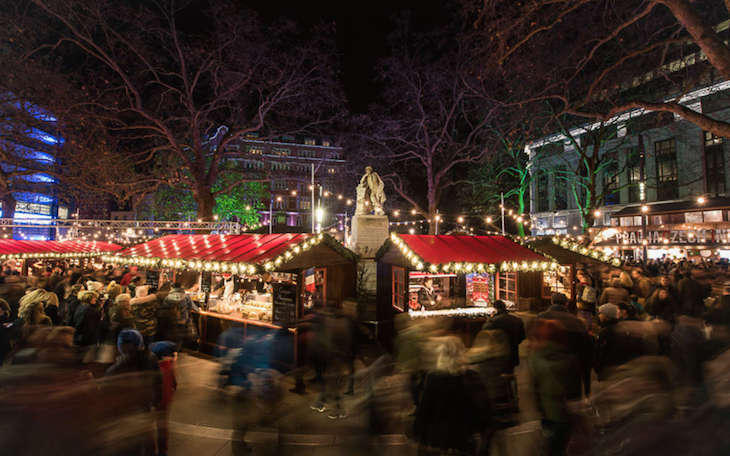 Wooden chalets, food stalls, Santa's Grotto and a 1920s spiegeltent all pop up in the centre of Leicester Square for Christmas, and it's free to wander around and enjoy the atmosphere. As with Winter Wonderland, you could spend a decent amount of dosh here if you were so inclined. The 1920s Spiegeltent has an impressive line-up of shows, from burlesque carols to silent discos, and of course you'll have to pay if you want to see Santa, or tuck into food or drink. Otherwise, you can pass a short amount of time here, enjoying the pretty lights for free, and snapping a few Instagram shots. It's much smaller than Winter Wonderland though — you'd struggle to spend a whole afternoon here. Christmas in Leicester Square. Free entry, 9 November 2018-6 January 2019. London's various Christmas light displays are switched on from early November (see the exact switch-on dates), and they're free to visit. 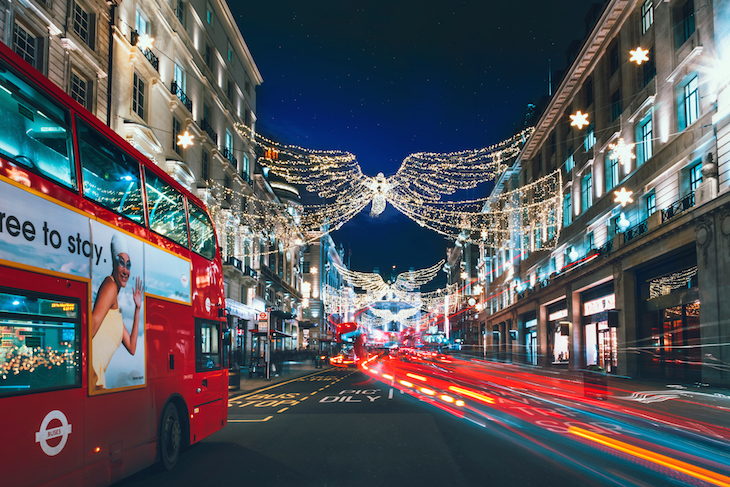 Wander round Regent Street, Oxford Street, Covent Garden, Carnaby and other areas in the dark to see London at its twinkly, festive best. If you can spare a couple of quid, hop on a bus for an even better way to see the lights. 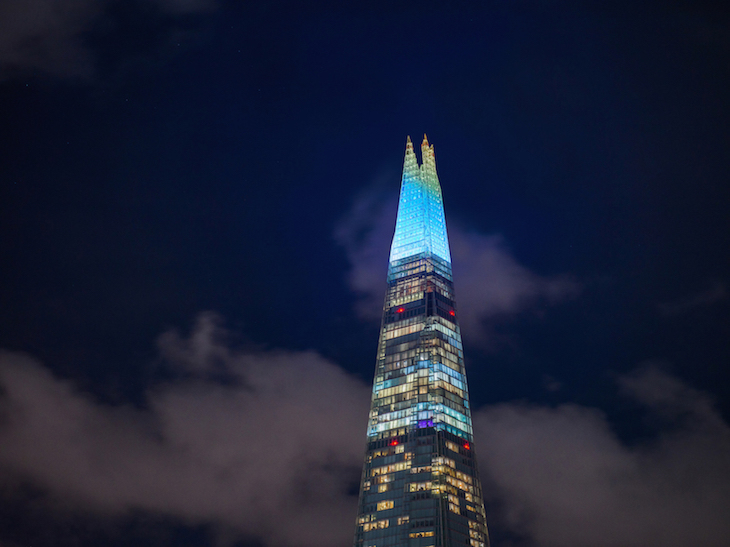 You'll be able to see The Shard's Christmas lights show from plenty of spots around London. A light show with the theme 'reflection' will be projected onto the top 20 floors of the building, from 4pm-1am every night from 3 December. Find somewhere to perch, get comfy, and watch the 30 minute show. 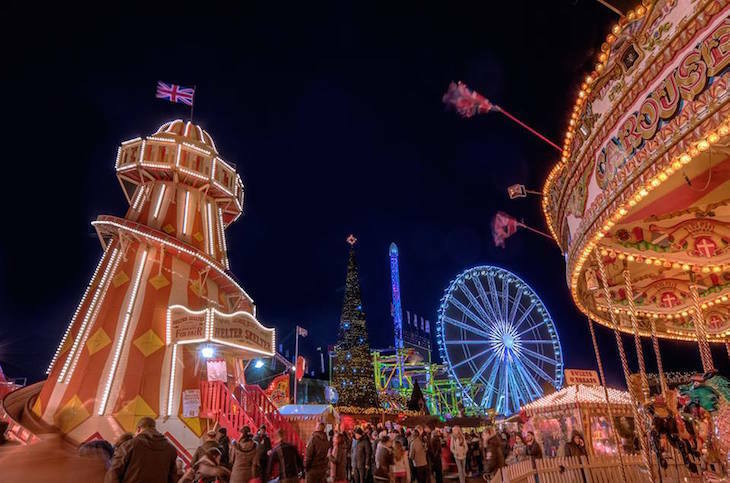 In addition to the two mentioned above, there are dozens of other Christmas markets and fairs to visit in London, and many of them are free admission (although again, you will of course have to part with your pennies if something tempts you). 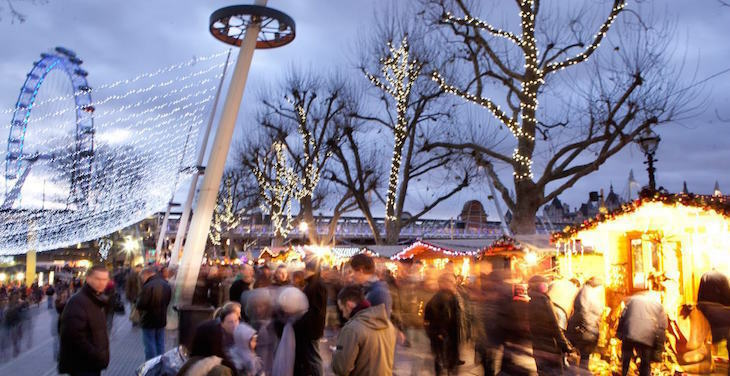 Top of the list is Southbank Centre's Winter Market (9 November-27 December), a cute collection of wooden chalets decked in sparkling lights, right next to the river. Head further east along the Christmas by the River (29 November-2 January), a Christmas market next to City Hall, with a backdrop of Tower Bridge. Lovely. 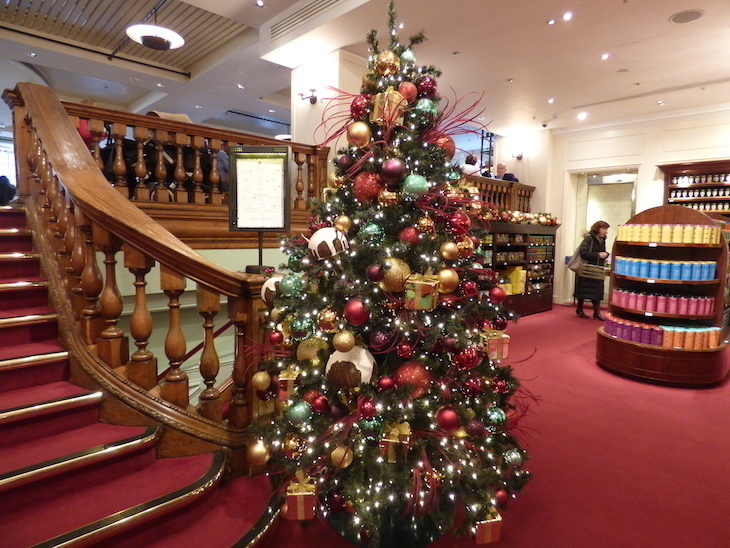 London's department stores are some of the most festive places in the capital. Well, they should be, they start cranking up the Christmas in August. The big four to hit up for Christmas are Harrods, Selfridges, Fortnum & Mason and Liberty — we always find Harvey Nicks a bit underwhelming at Christmas. It depends what you're looking for in a festive day out. Fortnum & Mason always sticks to a very traditional Christmas — think red and gold decorations, and an exquisitely decorated staircase. The Liberty Christmas department is a quaint affair, with hundred upon hundreds of baubles and decorations up in the rafters of the gorgeous wooden building. Selfridges tends to ramp things up a notch, and even more so this year with a 'rock 'n' roll Christmas' theme. You can't miss the giant disco balls hanging in the escalator well, and once you reach the top floor, Christmas is a full assault on the senses. Harrods? Well, it's Harrods isn't it. That world-famous tourist-attracting logo is vomited onto every bauble, teddy bear, Christmas card and advent calendar going, and the tourists lap it up. 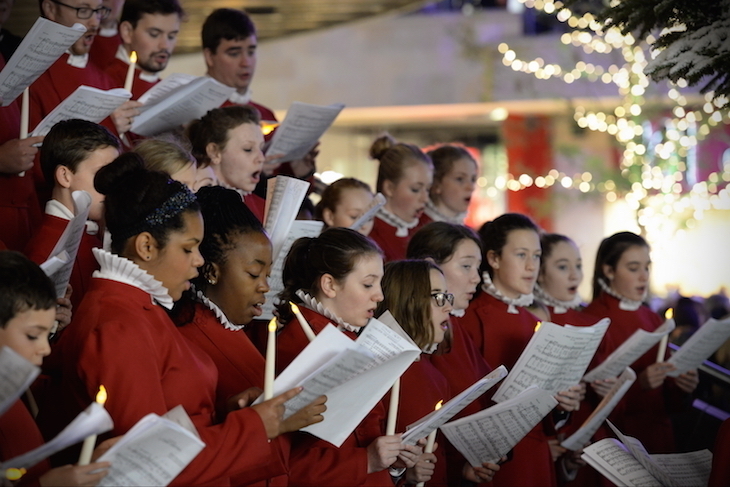 If you wanted, you could go to a carol concert every evening in December, and still barely scratch the surface of London's carol services. They're not all free — but many are for charity, so that's understandable — but why not see what's on at your local church? Take a look at our guide to spending Christmas in London for other festive things to do. If you're on less of a budget, why not take a turn on one of the capital's pop-up ice rinks, or settle down for a festive film screening.